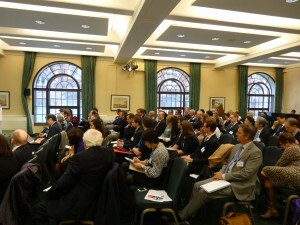 The ‘Local Growth, Global Links’ seminar co-organised by the Japan Local Government Centre (JLGC) and the Society for Local Authority Chief Executives (SOLACE) brought together 70 decision makers and professionals from the UK’s local government and economic development sectors, to examine their experiences for building partnerships outside the UK to build local economic growth. 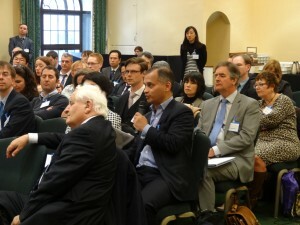 Chaired by MJ Editor Heather Jameson, the event saw a UK-Japanese line-up discuss the benefits that have been brought to UK local authorities by working with global business in the UK and building links with regions abroad. 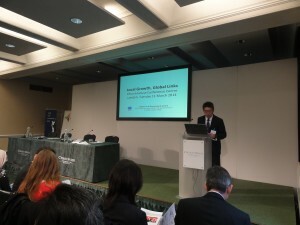 Gathering in Church House in Westminster, the day began with Kettering Borough Council in the East Midlands and chief executive David Cook, with reflecting on his experience of visiting Japan as part of the JLGC Japan Study Tour to Miyagi last autumn. The tour was an opportunity for representatives of the UK local government sector to see first-hand the economic renewal taking place in one of the prefectures affected by the Great East Japan Earthquake in March 2011. Since then, Miyagi has focused its efforts on attracting new investment to the region, winning the PublicAffairsAsia ‘Gold Standard Award for country or trade promotion’, for its global campaign and innovative new local schemes for economic development. Staying in the East Midlands but looking at Derbyshire, where the county council (alongside Derby city council and South Derbyshire district council) has been part of a twinning agreement with Toyota city since 1998, we heard from Cllr Joan Dixon (Cabinet Member for Jobs, Economy and Transport) and Rob Gorton (Corporate Planning Manager, Toyota UK), who both participated on CLAIR’s JET Programme, but are now engaged in different roles in Derbyshire around the presence of Japanese business in the local economy. Picking up the thread of Japan in the UK, specifically Derbyshire, Rob Gorton outlined the car-maker’s historic commitment to the county since 1992, with £2 billion invested and a workforce of 3,000. He also remarked that as production levels at its two UK plants vacillate between very high and very low depending on the state of the economy, the company’s commitment to engaging with the local community has been solidly consistent throughout. He summarised the company’s approach to working with the local community as being based on the two pillars of investment in the local environment and engagement with stakeholders. Both Rob and Joan also paid tribute to the JET Programme as a ‘valuable resource’ for local communities in the UK and Japan.